SPS and U.S. Orthotics announce the distribution of the complete line of U.S. Orthotics products throughout the United States and Canada. U.S. Orthotics products are now available for shipment from any of SPS four distribution centers, including the newest facility in Middleton, Pennsylvania. 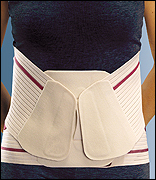 Featured among the U.S. Orthotics line is the 80D-10 lumbosacral corset. The deluxe elastic back support has a cushioned fabric back pad, elastic side panels, and Velcro® closures. The 10-in. back tapers to a 6-in. front with Velcro closure for easy fitting. Available in sizes SXXL. OPTEC's new Evotec orthosis is designed to support your patients at every stage of recovery. Made of a breathable, highly consistent elastic material that offers 50 percent more compression than those conventionally used to increase lumbar containment. Evotec is produced using a stitchless seam technique, has front and back moldable polymer panels, rear anatomical stays, a unique closure system for maximum compression, and arthritic grips for ease of donning and doffing. Detachable polymer panels can be removed to create a semi-rigid support with flexible stays. Available in beige or black in nine unisex sizes with neutral or pendulous abdomen. Fillauer's new and improved knee joint has the strength to rule. Extending the potential application for the medipro® Liner RELAX and the medipro® Liner akos, SPS announces the arrival of a new conical profile for both product lines. The RELAX TFC (transfemoral conical) features the metallurgic knit Umbrellan®, which protects the residual limb from environmental triggers while providing suspension and stabilization of soft tissues. The akos TFC liner is designed for transfemoral amputees without a cover to provide the best fit possible. An exterior glazing provides lubrication that allows the liner to easily roll up and down. Ohio Willow Wood announces the release of the Impulse® Foot and Ankle combination, which is available for patients who weigh up to 350 lb. The Impulse combination includes a multiaxial ankle with restricted dorsiflexion that allows for more foot response. An innovative blend of materials enables enhanced foot performance, and the sleek design allows for easy adjustment and cosmetic finishing. Impulse features stability as well as the ability to adapt to a variety of terrain. Knit-Rites new Dressing Retention Sock for both AK and BK utilizes a very soft compressive fit, with a belt suspension to cover and retain postoperative dressings for transfemoral amputees. Surgeons often want to limit compression therapy while still needing to retain postoperative dressings. Soft Lycra and Coolmax body for very low compression. Universal right or left belt system. Does not irritate or stress sutures during donning. Does not compromise peripheral circulation in marginal bypass vascular grafts. At times limited compression is desired. May be used with removable rigid dressings. Helps patients learn sock management. Very little staff training required. Wish you could shop for and order everything you need from one online source? Want all the pricing to reflect what is going to be on your invoice? 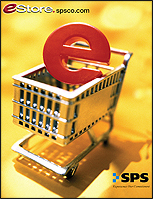 SPS eStore is now available 24 hours a day, seven days a week. More than 250 suppliers are represented online, so comparing products is simple. There are more than 97,000 stock keeping units (SKUs) available online from the newest products on the market to all-time favorites. There are no setup fees or user fees; eStore is free to all SPS customers. Otto Bock HealthCare has launched a new Reciprocating Gate Orthosis (RGO), a unique system that is easily adjusted for the needs of the growing patient. The RGO hip-joint system is designed to work in conjunction with the unilateral joint system. It is ideal for patients with traumatic paraplegia or spina bifida. The RGO features a biaxial joint that allows up to 15 degrees of pelvic rotation, making it easier for patients to change walking direction and more closely emulate a natural gait pattern. Becker Orthopedic introduces Tamarack 742-95, featuring 40 percent more assist. J. Martin Carlson, CPO, and president of Tamarack Habilitation Technologies Inc., says, "There are cases where orthotists would like even stronger assist options than have been available from our 742-85 series component. Tamarack now has a fully tested design that delivers those stronger options." Three sizes are available and, as always, durometers may be mixed and matched to meet individual needs. The Ortho Remedy Inc. announces the release of its new and improved EndoFoamTM Ultra, replacing the original and only pourable, molded foam-finishing system. Over the past eight years, EndoFoam has proven to be an effective method for cutting overall costs and time spent in the laboratory. The new Ultra is firmer, lighter, and easier to shape than the original. It also provides a more realistic skin and color. 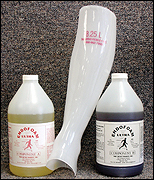 EndoFoam Ultra is available in one-gallon kits, which yield up to 35 below-knee foam covers. Available at Becker Oregon, the Shadow Series ultra-lightweight orthosis combines the structural strength and stability of the traditional metal-and-leather device with the fit and cosmesis appeal of a thermoplastic device to produce a cutting-edge orthosis. Patient applications include polio, post-polio, CVA, MS, CMT, SCI, and TBI, among others. Anyone wanting to upgrade from metal-and-leather devices to a lighter, stronger, and more stable laminated product should look to the Shadow Series. Two new liner alternatives from Ossur are available at any of the four SPS Distribution Centers Atlanta, Georgia; Dallas, Texas; Paso Robles, California; and the newest facility in Middleton, Pennsylvania. The firm silicone outer-layer of the Iceross® Synergy Liner provides stability for active use, while a softer, shock-absorbing inner layer nurtures the skin. Available with the WAVE feature, Synergy offers superb suspension and comfort. 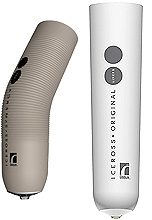 Also available is the updated and improved Iceross Original, recommended for users who require good stability and suspension at all activity levels. The new FullStrideTM stance-control orthotic knee joint, manufactured by Becker Orthopedic, is now available at PEL Supply. FullStride delivers maximum control of varus/valgus instability and knee hyperextension. With its low-profile cabling system, FullStride automatically locks and unlocks during the gait cycle, providing natural movement with superior stability and full control of the knee joint. Easily converted into an automatic spring-lever lock knee joint, FullStride is interchangeable with other joints in the Becker stride stance-control family. FullStride uses fewer specialized components, making it easier to fabricate and fit, which reduces follow-up maintenance. 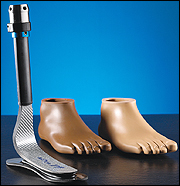 The Axtion® DP is the newest product to come out of Otto Bocks incredible line of feet. Its design delivers high performance for active patients who enjoy demanding activities. This carbon-fiber foot incorporates ultra-lightweight materials in a pylon design. The Axtion DP features include torsional rotation and terrain compliance for even more stability. Cascade Orthopedic Supply now offers Ortho-Care plaster products, fast becoming a new favorite among many facilities. The ultra-creamy Ortho-Care plaster wets quickly and completely, and it sets fast and solid. Made of high-quality plaster and substrate, Ortho-Care products put more plaster in the cast and less on your floor. Individually wrapped, spooled rolls reduce telescoping, and plaster bandages are available in two set speeds and several widths. Extra-fast setting plaster splints are available in 15- and 30-in. lengths. Fiberglass cast tape comes in four-yard rolls. Ossur's most popular liners just got better. The new WAVE feature makes our Dermo® and Stabilo® the most flexible liners available today. The unique WAVE feature depicts a circumferential wave design which is incorporated through the silicon layers and includes the fabric cover. Resembling a bendable drinking straw, this feature allows the liner to more easily extend over the patella, with less bunching behind the knee. Increased knee flexion provides a larger range of stretch around the knee ensuring true comfort and stability. The liners are also retrofitable with our 3mm standard Icerossliners. 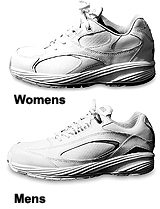 Knit-Rite announces the addition of the Aetrex® EssenceCollection to its full line of orthopedic shoes for women. All footwear in the collection is made with full-grain leather and polyester linings that transfer moisture for maximum comfort and breathability. Soft padded collars, firm heel counters, and a unique polyurethane outsole provide comfort and prevent slippage. Every shoe features a quarter-inch removable depth in two layers to ensure a proper fit with any orthotic. The Aetrex Essence Collection is designed to hold the heel in place while providing plenty of space for toes and maximum comfort. Knit-Rite announces the availability of SoleTech® Advance Walking Comfort, a new last for men and women designed to provide a medium-depth fit with adjustability for a wide range of foot sizes. Two different insoles are included for flexibility in fitting and are easily removable to accommodate custom orthoses and AFOs. The outsole provides lightweight cushioning and flexibility. SoleTech combines this with a "wear-like-iron" rubber outsole bottom that makes it easy to modify this athletically styled shoe. Thanks to the new SmartKnit AFO liner, a protective sleeve for plastic AFOs now available at Knit-Rite, the wearer can step out in style and comfort no matter the setting or the season. Cover the brace with the tan-colored AFO liner and wear sandals without socks, or keep cool with the white liner and comfortable SmartKnit anklet or sport sock. For a night on the town, try the black liner. The SmartKnit AFO liner wicks away moisture from the wearers legs, and the yarns are "corespun" around Lycra to reduce wrinkling and increase conformity to various AFO shapes. No matter the terrain, Endolites new Esprit® Foot can handle it. The lightweight, low-profile foot is designed for active walkers with a variety of cadences and styles. The independent heel-and-toe design responds and adapts to all types of terrain, absorbing shock and increasing comfort, and Esprit's tri-pod design is built for superior ground compliance. The tri-pod system enhances ramp and turning abilities while providing added limb stability. 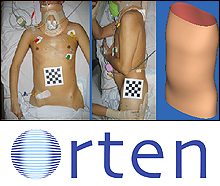 This software innovation by Orten allows professionals to take pictures of patients with any digital camera and create a 3D file. With OrtenPIX ® , create and modify precise TLSO files for bedridden patients, or BK, KO files from only two pictures. Orten's CAD file is industry-standard compatible. Practitioners can send the file to their own in-house carver or to their preferred central-fabrication center/manufacturer. Demonstrations will be available at the AOPA national assembly September 17-20, in Las Vegas, Nevada, or contact Orten for a free demonstration today. Orthofeet introduces the unique Fisherman sandals, for women and men, that blend biomechanical features with summer comfort and style. The sandals are built on anatomical extra-depth lasts that accommodate thick orthotics, while the hidden-depth design provides the appearance of stylish sandals with normal depth. The uppers are lined with soft fabric, padded with foam, which provides protection against irritation. Stretchable construction across the forefoot offers an adjustable fit for forefoot deformities and swollen feet. The new Fisherman sandals received A5500 SADMERC code verification.